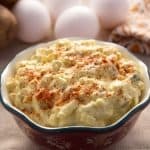 It's kinda like potato salad and egg salad had a baby! Add water and steamer basket to Instant Pot. Place potatoes and eggs in basket. Close lid and set manual time for 4 minutes at high pressure. Once cook time is complete, quick-release pressure. Place eggs in an ice bath to cool. Pour potatoes into a colander, then transfer to a sheet pan to cool. Meanwhile in a large bowl - combine mayonaise, pickles, mustard, salt and pepper. Remove shells from eggs and roughly chop using an egg slicer (or knife if you don't have one). Then add eggs to mixing bowl and mix well. Once potatoes are cool, add them to mixing bowl and gently mix until well combined. Transfer to serving dish and garnish with paprika. Chill for at least 2 hours - preferably overnight. The quantities of this recipe are perfect for a family gathering, potluck, or picnic. They can be scaled down accordingly.